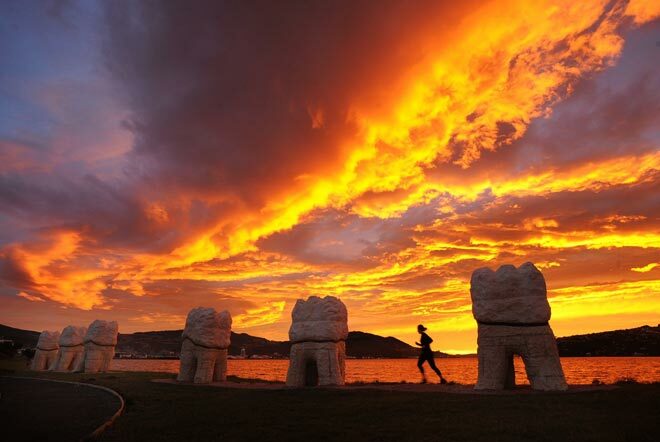 Regan Gentry's 'Harbour mouth molars' (2010), situated at the south end of Otago Harbour, plays with the personal and local significance of dental work. While he was a fine arts student in Dunedin, which has the country's only dental school, Gentry experienced difficulties with his wisdom teeth and finally had them extracted. Later, he saw the 'cultural connection between the idea of installing teeth into Otago Harbour and the volcanic history of Otago'. 'Harbour mouth molars' are six large wisdom teeth made of Ōamaru stone and concrete that have 'erupted' from the gummy mud of Otago Harbour.